Ericka Cruz Guevarra is a breaking news/general assignment reporter at OPB. 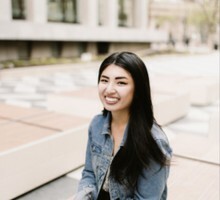 She’s worked as an on-call interactive producer at KQED Public Radio in San Francisco and was KQED’s first Raul Ramirez Diversity Fund Intern. Ericka also worked with NPR’s Code Switch team where she assisted with production for the Code Switch Podcast. She’s an alumna of NPR’s Next Generation Radio project at KJZZ in Phoenix and graduated from San Francisco State University. Most importantly, she’s one of very few adults in the world who still enjoys bubblegum flavored ice cream. Level 3 "go now" evacuation orders are in place for residents in Lyons, Oregon, because of a grass fire first reported Tuesday afternoon. Two members of far-right groups known for brawling in the streets of downtown Portland have been indicted on assault charges, the Multnomah County District Attorney's Office announced Tuesday. Vancouver Police Department's top leader says a recent string of police shootings involving his officers is unusual for a city Vancouver's size – but he isn't proposing any changes at the department. Newly released documents from the Portland Police Bureau show the officer who killed Andre Gladen may have lost possession of a knife during the fatal encounter. Thousands of downed trees from a massive dump of snow last week has left hundreds of power poles and miles of wire scattered across snow-covered areas of rural Douglas County. Oregon leaders are preparing to sue the Trump administration over a new rule they say will "significantly restrict access to reproductive health services and information." A grand jury decided that no criminal prosecution is warranted against PPB Officer Consider Vosu who shot Gladen. Portland Police Chief Danielle Outlaw repeatedly asked speakers Thursday night to come with solutions to mistrust toward the police bureau present for “years and years." Portland Mayor Ted Wheeler and Police Chief Danielle Outlaw will meet Friday with the family of a black man who suffered from schizophrenia and was shot and killed by police last month. The union representing commanding officers at the Portland Police Bureau has filed a complaint against city commissioners following public comments they'd made about Portland Police Lt. Jeff Niiya. Portland city councilors voted Wednesday to extend a contract with an independent group that reviews police shootings and in-custody deaths. Lawmakers in Washington are considering legislation that could completely do away with the state's personal and philosophical vaccination exemption law. The number of confirmed measles cases in the Northwest has topped more than 50. Portland Police officers could have taken cover before trying to arrest Quanice Hayes, an African-American teen shot and killed by Portland Police in 2017, according to independent experts. The future of armed campus police at Portland schools is murky. Students who want them out say school resource officers play a role in the school-to-prison pipeline. But what do school resource officers actually do? The resolution approved Tuesday reverses an earlier agreement after school board members argued it's the city's – not the district's – responsibility to pay for the campus safety officers. A shirtless man seen shivering next to a pile of belongings in a widely-circulated video was shoved out of the Douglas County Jail and appeared to be experiencing a mental health crisis, a witness said.